Is the atractiveness of the temples of Angkor in decline? Covering at least 1000 square kilometer (390 sq mi), Angkor was by far the largest preindustrial city known to man. The sheer size and beauty of what is left of Angkor’s estimated 1000+ temples at the city’s core have puzzled foreign travelers as far back as the 16th century. Structures range from partially renovated temples, pagoda and imperial residences to recently discovered ruins which are virtual untouched for the last 500 years. Although one could spend a lifetime, most tourists will stick to 1 till 3 days. I happened to see, hear many Americans, however visitors from South Korea, Japan, China and Germany seem to top the list in consecutive order. Recently the popularity of the actual temples seems to have been surpassed by a more active pastime. 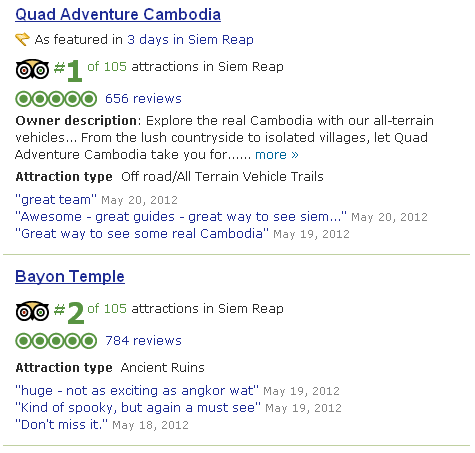 From over 10,000 reviews and ratings, the famous rating website Tripadvisor lists the rides from Quad Adventure Cambodia as the defacto no.1 attraction in Siem Reap province. The trip will bring you through some of the villages and country side around Siem Reap. Tripadvisor’s list is being followed by some of the actual places of worship, but runners up are horse rides, spa’s and playing golf. One could argue the majority, ie. the Asian and Chinese tourists in particular are less likely to comment on the site, since they have their own media, but I can’t help wondering: Are we becoming indifferent cultural barbarians? Note: When I first visited Angkor in December last year, I deliberately came fully unprepared. I wanted to have an unbiased awe feeling and learn to know all about it later. Any guide would spoil my precious first impressions. All I knew were some brief stories from others, a few photo’s and some scenes from the movie Tomb Raider. For some unknown reason I love decay and past glory. I was under the naive impression that Angkor Wat was somehow synonymous with all of Angkor and although I was impressed, I was somewhat disappointed too. All of it was in a fairly good condition. The planet had not reclaimed much. It turned out I was biased after all. Fortunately, later that day we visited Angkor Thom which revitalised my biased ‘Tomb Raider’ feel. In total I have now spent four days in Angkor. I would love to see a few larger temples which are fully unrestored. Perhaps I have to bribe some people for trespassing, this probably includes my ‘law abiding’ partner in order to temporarily increase her fudge factor. Perhaps I promise an ATV ride or something. I’ll keep you informed.